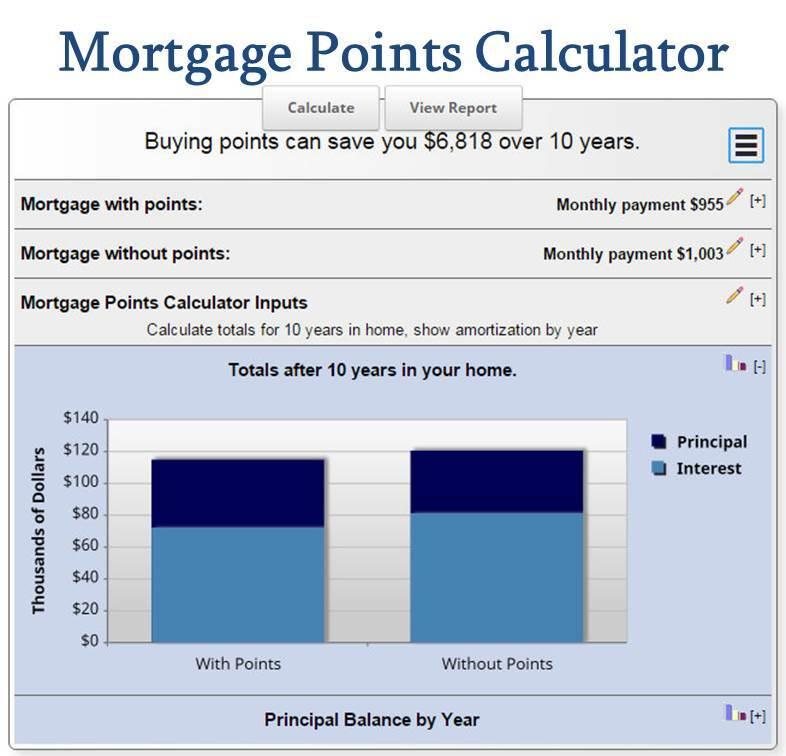 Mortgage Points Calculator helps you determine if you should buy down your mortgage rate using mortgage points. Buying mortgage points when you close your mortgage can reduce its interest rate, which in turn reduces your monthly payment. But each 'mortgage point' will cost you 1% of your mortgage balance. This Mortgage Points Calculator helps you determine if you should pay for mortgage points, or use the money to increase your down payment. The longer you own the home, the more savings you will reap in buying mortgage points over the long term. To choose how many years to compare, enter the desired comparison amount in the 'Years in Home' field and the report will reflect that comparison. Click on the "View Report" button to see the results, including a full amortization schedule - comparing with mortgage points and without mortgage points over the loan term. Feel free to use current Mortgage Rates in this mortgage calculator. To determine the mortgage rate after mortgage points, please request a personalized rate quote. You may also email the results by clicking on the three-line icon in the upper right hand corner of the mortgage points calculator. Looking for a different mortgage calculator? More Mortgage Calculators Here.